The tour was a great experience. 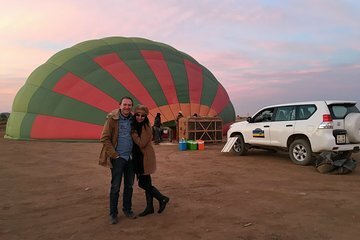 The tour was sold as a sunrise hot air ballon flight. However, we only took off at 8:15am. The staff said it was because of poor wind conditions but we saw another group return from a sunrise flight. Flight also lasted less than 1 hour, contrary to description. What an perfect way to celebrate our 20th Wedding anniversary. Professional service right from start to finish. Pickup on time, great trip out. Immensely enjoyed watching the balloon being inflated. Just so serene watching the sunrise over the desert. All finished off with breakfast before we headed back. Very early start bot so so worth it.